The Toronto Zoo's two pandas arrived at Pearson this morning, and the welcoming ceremony included Prime Minister Stephen Harper. Note: this is not an actual panda. Yes, the pandas were shipped from China by FedEx. The plane touched down a little before 11 a.m. this morning. 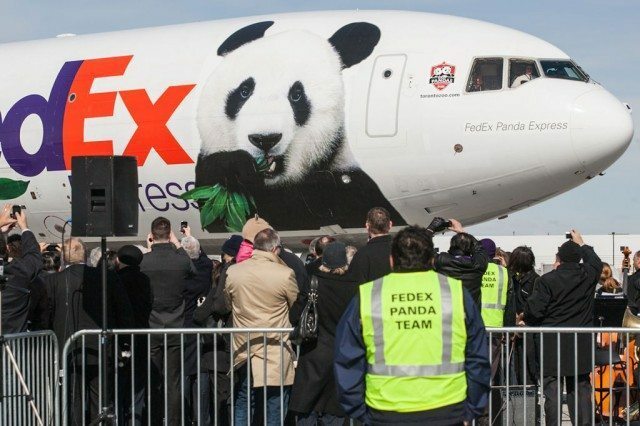 FedEx will also be periodically flying in bamboo for the pandas to eat. As you can tell from the branded safety vests, this landing ceremony was a bit of a FedEx publicity stunt. Mayor Rob Ford was there, with his widdle fwiend. Mayor Rob Ford and his entourage. Also present were Stephen Harper, his wife, Laureen (far left), and Chinese ambassador to Canada Zhang Junsai (right). The second woman in this photo is FedEx Canada president Lisa Lisson. The visiting dignitaries await the arrival of the guests of honour. FedEx workers used this fancy lift to get the panda crates out of the plane's hold. That's a panda, right there. This will likely be the last time anyone other than zoo staff gets a glimpse at either of these bears until May, when they're expected to go on display. They'll spend the interim in quarantine, getting to know their new surroundings. Prime Minister Stephen Harper personally signed for delivery of the pandas. The pandas were quickly shuttled to a nearby hangar. Before leaving for the zoo, they had to go through customs. Prime Minister Stephen Harper addresses the media. He's been taking credit for bringing these pandas to Canada, because the deal was sealed during his February trip to China. Giant pandas arrived from China at Pearson International Airport to much fanfare today at about 10:50 a.m. The welcoming committee for Er Shun (female) and Da Mao (male), the first pandas the Toronto Zoo has hosted since 1985, included Prime Minister Stephen Harper, Mayor Rob Ford, and Zhang Junsai (China’s ambassador to Canada), among other dignitaries. After Harper officially signed for the package—the pandas arrived on the “FedEx Panda Express” plane, with a specially trained flight crew—the prime minister and the China ambassador each said a few words about the significance of the pandas’ arrival in Canada. “Congratulations, Stephen Harper, for fulfilling the panda dream of the Canadian people, which couldn’t have come true without your personal commitment,” said Junsai. Er Shun and Da Mao are being taken directly to the Toronto Zoo, where they will be quarantined for 30 days as zoo keepers monitor the bears’ health. The zoo’s panda exhibit is scheduled to open sometime in May, where the animals will remain for five years, in the hopes that the pair will breed and produce an adorable panda cub. It’s expected that sometime in 2018 the two will be moved to the Calgary Zoo for another five years. The Toronto Zoo predicts the pandas will attract an extra 300,000 visitors this year, with a 10 per cent boost to memberships. The zoo is hoping that the boost in visitors, along with a $3 increase in admission price beginning in May, will help offset the price of its panda visitors. The Star reports that the zoo’s costs will run to $8 million for a newly renovated habitat, as well as $3 million each year in expenses. 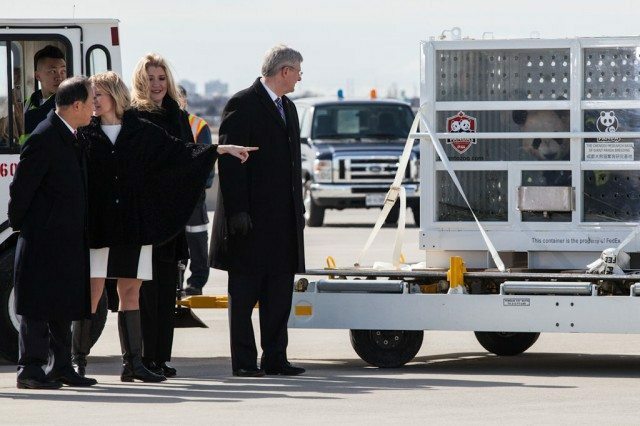 Torontoist was on the scene as the pandas arrived at Pearson this morning and emerged from the plane in crates. Check out the photo gallery above for giant-sized cuteness and an absurd amount of fanfare.